Last year spring blasted us early and fast. The ephemerals were here and gone in a flash like the wave of solar flares that interrupted satellite communication and bumped webinar schedules. This year spring arrived in a more typical and erratic fashion: warm one day, cold the next; windy one day, calm the next. Luckily nature has provided us with spring greens that cool the liver from winter excess and keep us healthy at the turning of the season. As I gaze out across the pasture on what would seem to the untrained eye like a profusion of yellow spring flowering weeds, a closer look reveals ragweed, creasy greens, butterweed, and wild mustard. What is of particular interest to me, however, is the creasy green, a southern culinary delight. Cultivated as a leaf vegetable since the 17th century they are a now a naturalized European heirloom import. Being the wild food forager that I am, creasy greens, also known as early winter cress, are a vitamin rich feast when not much else is available. Fortunately, the greens are edible right up to the point when they begin to go to seed and the yellow flowers are yummy in salads. Creasy greens are very tasty and extraordinarily high in vitamin A and vitamin C, both hard to come by in the colder months. They are also high in vitamin K. Young leaves are delicious raw in salads and older leaves can be cooked and eaten like spinach. 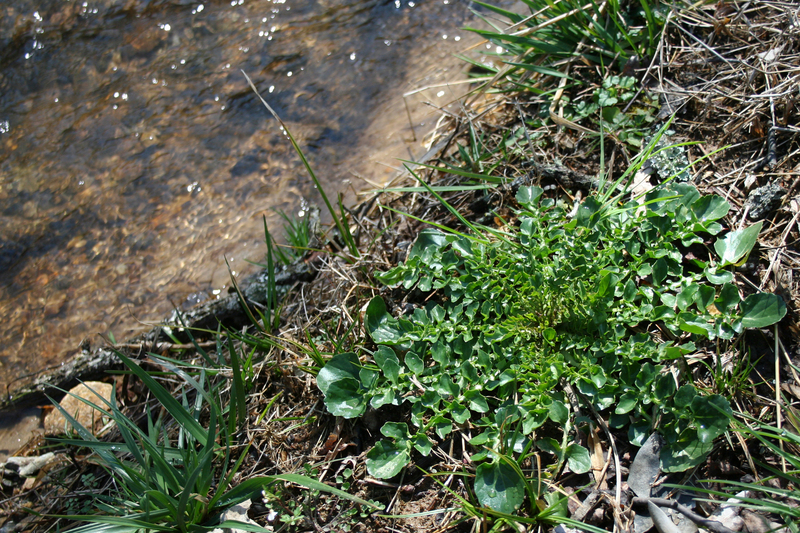 Creasy green, Barbarea verna, also fondly known as “creasies” in these here parts of the Southern Appalachians are a biennial, land-lovin’ cousin of watercress. 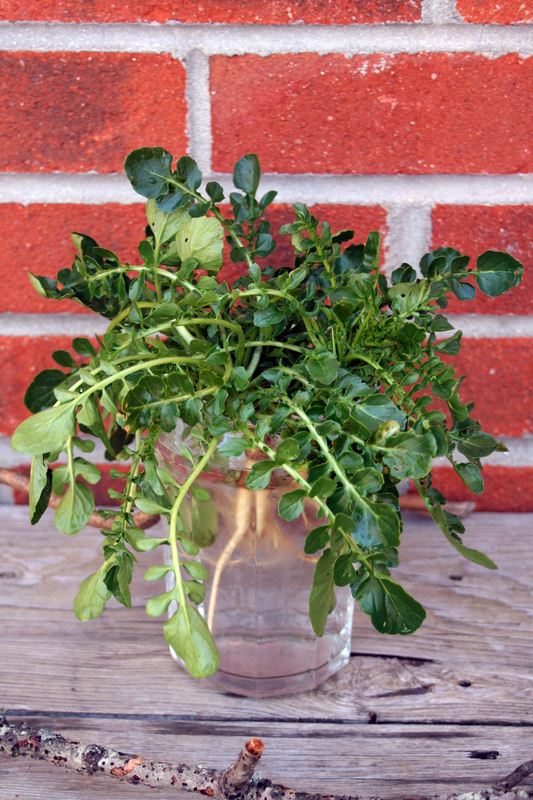 Back in the day an old England cress seller would walk through the streets with a basket full of cress yelling, “creases, creases!” In the Appalachians, originally settled by folks from the British Isles, cresses eventually became creasies or creecy and the name has remained. Other species like Barbarea vulgaris (common winter cress) found father north, or Barbarea orthoceras (American winter cress) found in the Pacific states can also be enjoyed almost year round. Barbarea is an Italian name given to this group of land cresses in honor of Saint Barbara’s Day, which falls on the fourth of December, implicating its use as a winter green. The Italians are very fond of these plants that hail from the brassicaeae or mustard family, especially the cresses and rockets, and they used them extensively in their cuisine. The Irish part of me welcomes the comin’ o’ spring each year with a freshly harvested basket of creasies. Creasies readily self sow (though not invasive) and are frost tolerant and winter hardy surviving sub-freezing temperatures. The outside leaves can be harvested continuously starting within a couple of weeks of emerging. Their leaves form a basal rosette and have from five to ten sets of lateral leaves below a bigger leaf at the end of the leaf stalk. 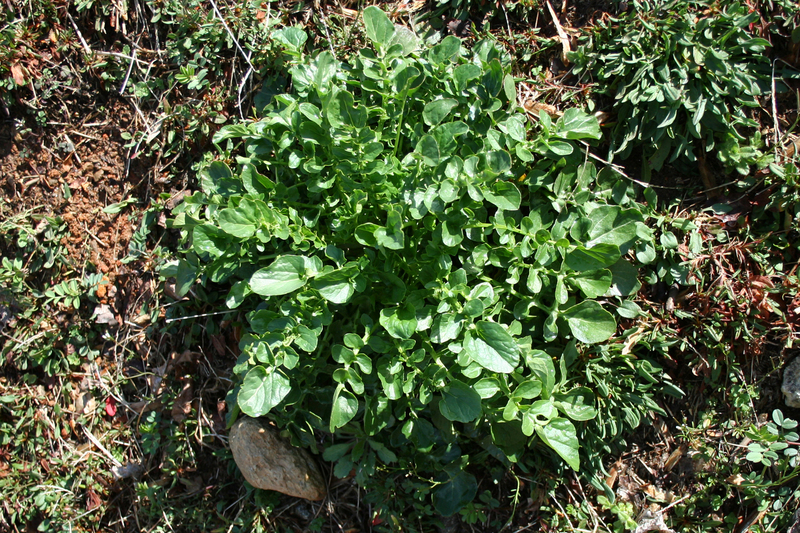 They are pungent with a peppery kick similar to watercress, somewhat bitter when eaten raw, but rather mild and sweet when cooked. As the heat of the season progresses so also does the peppery heat in the greens. In addition to finding them growing everywhere around my house, I was delighted to discover them stocked as a seasonal spring item in the canned goods section of my local Southern Appalachian grocery store labeled “Creecy Greens.” I like to cook them southern style in bacon grease (from organic, un-cured local bacon) with a splash of burdock root vinegar, or vegetarian style in sesame oil with a dash of toasted sesame seed oil for added flavor, also with a vinegar finish. In the South they are eaten as cooked greens served with buttermilk corn bread and many consider it a traditional Southern Christmas dish. They are also good in soups, stir-fires, and quiches. Legendary creasy greens, which have 3 times the amount of vitamin C as oranges, and twice the amount of vitamin A as broccoli, have even found their way into folk songs and ballads. Doug Elliot on his Crawdads, Doodlebugs, and Creasy Greens CD performs one of my favorite creasy green songs. The accompanying songbook even has more Creasy lore! So go get yerself a mess of creasy greens this spring! 2 bunches fresh greens, about 8 cups, washed, de-spined and coarsely chopped. Heat oil or drippings in a large skillet over medium heat and add onions, sautéing until translucent. Add greens and stir to coat with oil. Stir-fry until greens are wilted. Reduce heat and add stock and stir, allowing greens to steam until tender. Finish with a dash of vinegar. Salt and pepper to taste. News Flash! I am sorry to report that Betty Ann canned Creecy Greens are no longer on the market and I have not been able to find a replacement. Side note: they are much better fresh anyway!